Club Trust, LLC is the parent company of staySky Vacation Club LLC. Investors will have an ownership, equity interest in this resort management company lead by experienced industry professionals. The project will provide investors with a preferred return of 5% annually to be paid six months following their I-526 application approval. The EB-5 immigrant investors will serve as Investing Members of the EB-5 Company, Club Trust, LLC, which is the EB-5 job creating entity. Due to the fact that EB-5 investors will make an equity investment in the job-creating EB-5 company, all jobs will be direct to meet the EB-5 direct program eligibility requirements. Here's how it works. The United States government has set aside 10,000 visas annually in an entrepreneur investor category known as EB-5. This investment program was created by Congress in 1990 to stimulate the U.S. economy through job creation and capital investment by foreign investors. Each foreign investor must create 10 full-time jobs for U.S. workers within two years of the investor's admission to the United States as a Conditional Permanent Resident. The Club Trust, LLC EB-5 Project is located in a Targeted Employment Area (TEA). So there is only a $500,000 USD investment required and investors can be confident of their application approval. What is the StaySky Vacation Club? Club Trust, LLC, operating under the “trade” name of staySky Vacation Club (“SSVC”), is a new business enterprise that will operate a family-friendly vacation club in the Orlando, Florida area – one of the U.S.’s most popular vacation destinations. Club Trust, LLC will offer high quality Vacation Club Memberships based on an excellent location, top-tier customer service, and exclusive club member benefits. Vacation clubs are a newer variation of the timeshare model. Instead of purchasing the rights to a specific unit, as in a traditional timeshare vacation club model, “Members” pay an upfront sum to purchase a designated number of “points” which can be redeemed for different vacations each year. The allotment of points can translate to very different vacations based on resort location and the time of year. As an example, The Marriott Vacation Club has a three-tiered point system. At the basic membership level, the Member’s vacation option is a seven-night stay in a studio in Palm Beach, Florida at any time except during the peak winter season. In contrast, the highest tier of points grants the opportunity to stay for seven nights in a one-bedroom villa in Oahu, Hawaii at any time during the year. A wide selection of membership plans within SSVC will provide Members with the ability to select an appropriate plan based upon their particular vacation goals and financial capabilities. Each SSVC Member will purchase “points” (which can be thought of as a transactional currency) that they can use, at their discretion, within the framework of the SSVC membership plan they have selected. SSVC will utilize units, including studios, one, two, three, and four bedroom units, from properties within the staySky Hotel and Resorts (“SHR”) portfolio as inventory for the SSVC. SHR is an experienced and reputable resort and hospitality management company that has been in business since 2005 and currently manages many successful hotels and resorts located in Florida and the Caribbean. Units for vacation club inventory will be drawn from SHR properties in a high unemployment rate Targeted Employment Area (“TEA”) in the Orlando, FL area and will be newly renovated to conform to the current high standards observed in the membership club marketplace for use in the SSVC Vacation Club program. Club Trust, LLC has developed and obtained all regulatory approvals required to offer a choice of tiered SSVC Membership Plans to its Members which they will purchase through a points-based system. A membership will give SSVC the Member access to SSVC resorts, as well as to a points-based exchange service such as Resort Condominiums International (“RCI”) or Interval International (“II”), which partner with a network of vacation club resorts and maintain a points exchange marketplace in which a Member’s points can be used as currency to “buy” a vacation at another club within the network. In this way, SSVC’s affiliation with other clubs through RCI or II will serve to increase SSVC Member benefits and services, as well as provide a wider selection of vacation destinations, greater availability, and more flexibility as to vacation dates. Initially, the units to be included in the SSVC program will include existing units owned by the developer. Additional units located at SHR Properties will be purchased by Club Trust, LLC, converted, and renovated to conform to the current high standards for use in the SSVC Vacation Club program. The properties include Lake Buena Vista Resort Village and Spa, The Enclave Resort, Hawthorn Suites by Wyndham at Lake Buena Vista, and Hawthorn Suites by Wyndham at Universal Orlando. 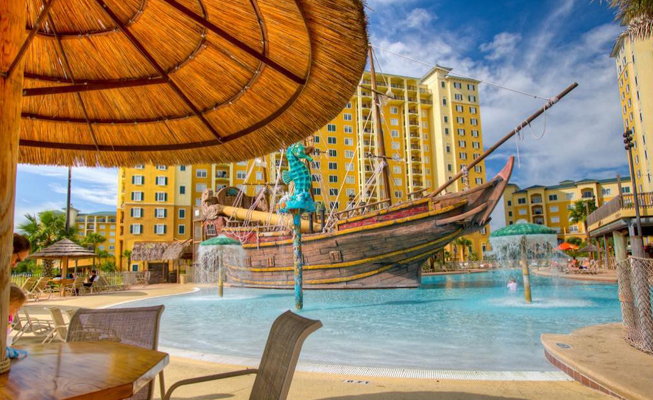 The Lake Buena Vista Resort is located in the heart of Central Florida’s best attractions. Nearby, Guests will find Walt Disney World, SeaWorld, Lake Buena Vista Factory Stores, and Universal Orlando. It is also close to Orlando’s International Airport and Convention Center. 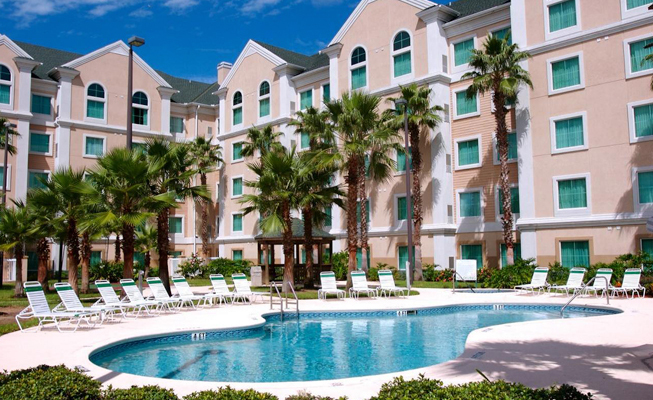 Lake Buena Vista is a luxury condominium resort that lets guests enjoy their vacation with all the comforts of home. Beautifully furnished units feature two-, three- and four-bedroom suites and spacious floor plans to suit any group. 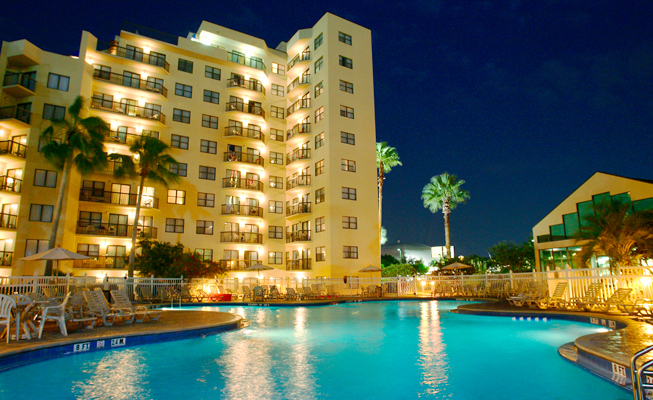 The Enclave Resort is located at the heart of Orlando's most celebrated attractions, one block from International Drive, close to many restaurants, shops, and attractions. The Enclave Resort is just minutes from the Orange County Convention Center - the perfect venue for meetings and large events. But those who just want to relax can enjoy the many onsite amenities and nearby attractions of our Destination Universal preferred resort in Orlando. For social events, the resort can easily host a banquet for up to 100 guests, with catering and a tropically inspired property. The Hawthorn Suites at Lake Buena Vista is located in the heart of everything there is to do and see in Orlando. The property is only a half mile from the entrance to the world-famous Walt Disney World® Resort and only one mile from the Downtown Disney area. In addition to providing the perfect Orlando headquarters for the vacationing family, the resort offers more than 1,800 square feet of event space as well as onsite business services. One-bedroom suites or executive guestrooms are available. Don't delay! Only a limited number of positions are available for qualified, accredited investors. For further details, please register on this site.